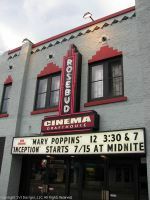 formerly Tosa Cinema, which opened in 1931. It was the first theater in Milwaukee operated by Ben Marcus, founder of the Marcus Theatres chain. This movie theater is near Wauwatosa, Milwaukee, W Milwaukee, West Milwaukee, West Allis, Elm Grove, Greenfield, Glendale, Butler, New Berlin, River Hills.